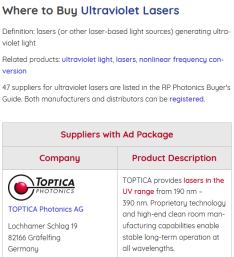 The RP Photonics Buyer's Guide contains 10 suppliers for direct diode lasers. Direct diode lasers are laser devices where the output of laser diodes is directly used for an application like laser material processing. This is in contrast to using diode-pumped lasers, where the diode laser radiation is used for pumping another laser, typically a solid-state laser, the output of which is then sent to the application. That additional laser usually acts as a brightness converter: although some of the optical power is lost, the beam quality of its output is so much higher than that of the diode laser(s) that the brightness (more precisely: the radiance) is still higher. This allows for increased optical intensities on workpieces, for example. The direct use of diode lasers is attractive for different reasons: such laser sources are overall simpler and more compact, and their wall-plug efficiency is substantially higher, as conversion losses are avoided. However, the beam quality of high-power laser diodes has for many years been clearly too low for direct application e.g. for laser welding. The rapid technical progress in this area has in recent years increased their beam quality and brightness to such high levels that many direct diode applications have become possible. Direct diode lasers are therefore now even used for laser welding, particularly for conduction welding of relatively thin metal sheets. Laser soldering and brazing, laser cladding and some laser surface treatments also belong to their applications. The improved brightness of high-power laser diodes his different origins. One factor is the continuous increase of brightness of diode bars and diode stacks through improvements of their design. Another factor are improved methods and components for beam combination of the radiation of many laser diodes. In the same way as solid-state lasers, direct diode lasers can either emit a free-space laser beam or can be fiber-coupled.